15 weeks of the NFL season are over with and the weekly power rankings are slowly coming to an end. With two weeks left until the playoffs begin, the playoff races got a whole lot tighter after a wild upsetting week 15. In what no one saw coming, the Kansas City Chiefs upset the undefeated Green Bay Packers at home 19-14, ending the Packers undefeated season at 13-0 to drop them to 13-1. There were questions surrounding the perfect Packers for once they lock up the #1 seed in the NFC, should they rest their players and have them fresh and ready for the playoffs, or keep playing their starters and go for the perfect season. Now with their first loss on their hands, they don’t have to decide what to do anymore, they can rest their star players without any repercussions and have them healthy and ready for the playoffs. Green Bay has yet to secure home field advantage throughout the NFC playoffs and need a win vs Chicago on Christmas night, or a 49ers loss at Seattle, who happen to be hot and fighting for a playoff spot in the wild card race, to secure the #1 seed. In another shocking upset, the winless Colts defeated the 7-6 Titans dropping them to 7-7 after an embarrassing 27-13 loss in Indianapolis. The Colts avoid being the second winless team in NFL history and notch their first win and still have a good shot at the #1 pick in the draft. More upsets occurred too, as the Redskins upset the Giants 23-10 at MetLife Stadium, finishing a shocking sweep of the Giants in the regular season. The Philadelphia Eagles walloped the New York Jets down in Philly 45-19, moving onto 6-8 on the season and keeping their NFC East title hopes alive and can win the division if they beat division leaders Dallas on Saturday, the Jets beat the Giants on Saturday, and the Eagles win week 17 and the Giants beat the Cowboys on week 17 too. Seems complicated, but it’s not too far-fetched. The Jets drop to 8-6 and are tied with the Bengals for the final Wild Card spot in the AFC but the Jets would get the nod due to common opponents record. The New England Patriots went into Denver and gave the Broncos and Tim Tebow a harsh beat down, 41-23 and dropping the Broncos to 8-6, and giving the Raiders life to win the West after they fell to the Lions at home 28-27, and the Chargers life because they pulled off an upset 34-14 against the Ravens at home on Sunday night. It was a crazy week 15, and now it’s time for a crazy new edition of the power rankings, so here we go. 1.Green Bay Packers (13-1) lost to Kansas City Chiefs 19-14. Last week (1). The Packers suffer their first loss and now look to lock up home field in the NFC. 2.New Orleans Saints (11-3) defeated Minnesota Vikings 42-20. Last week (2). The Saints thrash the Vikings as Drew Brees nears Dan Marino’s single season passing yards record. 3.New England Patriots (11-3) defeated Denver Broncos 41-23. Last week (5). The Pats stomp the Broncos and currently hold the top record in the AFC with a very easy final two games on their schedule. 4.San Francisco 49ers (11-3) defeated Pittsburgh Steelers 20-3. Last week (10). The 49ers defense stifles the Steelers and gives San Fran the inside track to the #2 seed in the NFC so far. 5.Houston Texans (10-4) lost to Carolina Panthers 28-13. Last week (3). The Texans suffer their first hiccup with TJ Yates at QB, and go from the #1 seed in the AFC to the #3 seed. 6.Pittsburgh Steelers (10-4) lost to San Francisco 49ers 20-3. Last week (4). The Steelers miss a chance to take over as the AFC’s #1 seed with the Ravens loss on Sunday night. 7.Atlanta Falcons (9-5) defeated Jacksonville Jaguars 41-14. Last week (9). The Falcons look like they’re headed back to the playoffs as they need just one more win to lock up a playoff spot. 8.Baltimore Ravens (10-4) lost to San Diego Chargers 34-14. Last week (6). The Ravens get taken care of by the Chargers and get help by the Niners after taking down the Steelers the next night and keep the AFC North in the Ravens grasps. 9.Detroit Lions (9-5) defeated Oakland Raiders 28-27. Last week (12). The Lions beat the Raiders on a game winning 99 yard drive capped off by Calvin “Megatron” Johnson’s second TD grab of the game with under a minute left. 10.Dallas Cowboys (8-6) defeated Tampa Bay Buccaneers 31-15. Last week (N/R). The Cowboys smack the Bucs and take a one game lead over the Giants headed into the final two weeks of the season and can clinch the East with a win and Giants loss on Christmas Eve. 11.Denver Broncos (8-6) lost to New England Patriots 41-23. Last week (7). The Broncos face a reality check with a loss against a top playoff contending team and need to regroup and win the West possibly this week. 12.New York Jets (8-6) lost to Philadelphia Eagles 45-19. Last week (8). The Jets get demolished by the Eagles but still hang onto the 6 seed due to a common opponent record with the Bengals headed into the final two weeks. NFC Player Of The Week: New Orleans Saints QB Drew Brees – 32 of 40, 412 yards, 5 TDs, 0 INT. HM: Detroit Lions QB Matthew Stafford and WR Calvin Johnson – 29 of 52, 391 yards, 4 TDs, 0 INT. 9 catches, 214 yards, 2 TDs. AFC Player Of The Week: Miami Dolphins RB Reggie Bush – 25 carries, 203 yards, 1 TD. HM: Oakland Raiders WR Darius Heyward-Bey: 8 catches, 155 yards, 1 TD. 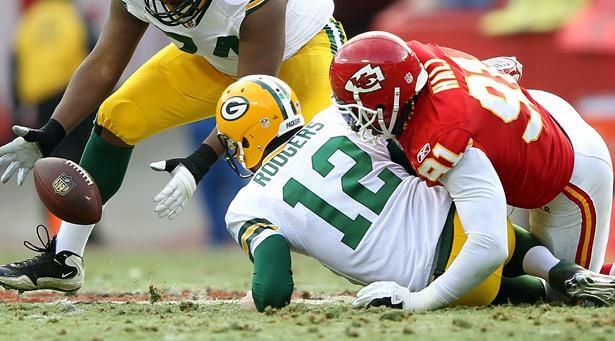 Upset Of The Week: Kansas City Chiefs defeat Green Bay Packers 19-14. HM: Indianapolis Colts defeat Tennessee Titans 27-13. Most Exciting Game Of The Week: Detroit Lions defeat Oakland Raiders 28-27. HM: Kansas City Chiefs defeat Green Bay Packers 19-14. 1.New Orleans Saints QB Drew Brees. Last week (2). 2.Green Bay Packers QB Aaron Rodgers. Last week (1). 1.Minnesota Vikings DE Jared Allen. Last week (1). 2.Philadelphia Eagles DE Jason Babin. Last week (N/R). 3.New York Jets CB Darrell Revis. Last week (2). 1.Carolina Panthers QB Cam Newton. Last week (1). 2.San Francisco 49ers LB Aldon Smith. Last week (N/R). 3.Arizona Cardinals CB Patrick Peterson. Last week (N/R). This entry was posted on December 20, 2011 by stevep. It was filed under Uncategorized .